Located in the heart of Yalong Bay Resort District, Pullman Sanya Yalong Bay Villas & Resort is 45 mins' drive to the airport, 30 mins to downtown and 10 mins to the Yalong Bay bullet train station. Set amidst a landscape of its own tropical gardens and blue lagoons, the resort features 115 villas with a private swimming pool, 7 suites and 73 well appointed rooms into three architectural styles: Thai, Myanmar and Nanyang, to deliver an unrivalled visual ambiance. Pullman Sanya Yalong Bay Villas and Resort has 80 rooms from 42 m² to 86 m² in the main building and 115 villas varying from 150 to 660 m². Villas feature different Thai, Myanmar or Nanyang designs, with their own swimming pool and tropical garden. Enjoy Cantonese, Thai and local cuisine in our Chinese restaurant in a relaxing environment. Serving simple food, hand-made noodles, cold starters, renowned regionally by a very experienced noodle chef. A perfect place to taste various cocktail and afternoon tea. Tony at the Front desk welcomed me and set the tone for the stay. Made me feel at home and he was very personable and attentive with excellent English. Great follow up as well. The other staff were also great and always made sure that I was being served promptly. I love the room I had with the private swimming pool. My dream hotel room. Will never stay anywhere else in Sanya. Drain of the sink in bathroom is too slow. When the door was open, there was too much noise coming from the road nearby. these were what made me feel bad. The environment inside is beautiful. Besides, when my friend needed help that your hotel couldn't offer, one of your employees helped personally. So kindly! The location of pullman is ok, and the villas area is beautiful. You could enjoy nice environment and view in and out the hotel both. Good food and services. However it does not have a beach service by Pullman as it is having a 10min walking distance to the beach. The nice thing is villa having a swimming pool by each, you could call few times to make sure they will come to clean the leaves on and in water. Normal standard experience for me. Almost meet my expectation. Overall is good, hope pullman can provide various options for food with wider price range. Staff are very friendly, they provided excellent services that were beyond our expectations. Although the hotel itself is bit dated, that the toilet seat in my villa was broken. All in all, we had a pleasant time. The hotel is not in the beach area and it takes more than 5 minutes to the beach on foot. Each villa has a private swimming pool and the hotel has a big pool. Since all of them are not heated pools, I saw no one swim because the water is very cold in January. 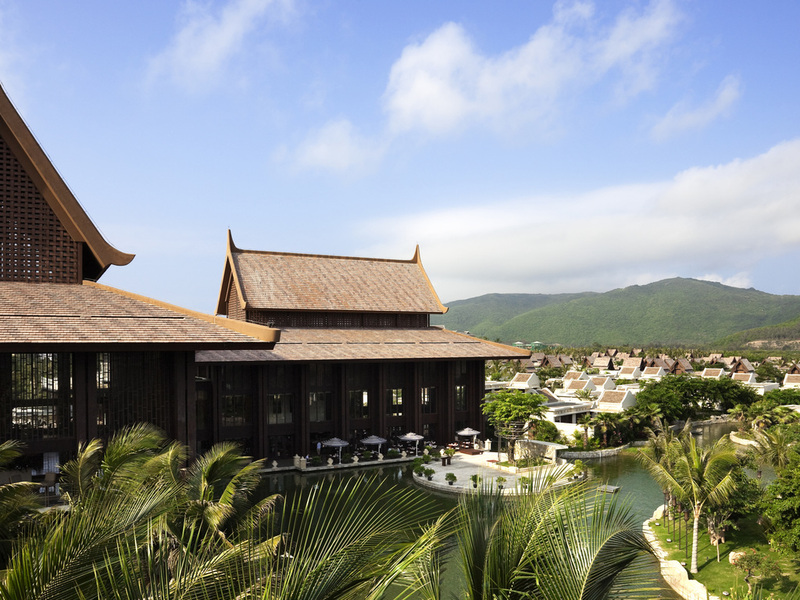 I stayed 3 nights in the Pullman Oceanview Sanya Resort and Spa and 3 nights in Pullman Yalong Bay Sanya Villas and Resort. Though I was generally satisfied with facilities of the latter hotel, I highly recommend the Pullman Oceanview Sanya Resort and Spa. I cannot agree more with other guests of this hotel and my friends who had stayed there, the service of all hotel staff, including the reception, the pool (there are 5 pools on the hotel) and the both the Chinese Restaurant and the Sand (Cafe House) Restaurant are excellent. I visited Sanya twice or thrice a year and each and every time, I enjoyed thoroughly my stay with the Hotel. The Chinese food is gorgeous, yummy, yummy ! This hotel I definitely strongly recommend in particular to those visiting Sanya for holiday with fily and kids. The overall rate was Great. The Thai Villas was beautiful, it was very nice &amp; quiet &amp; very relaxing. I absolutely loved the bed, all set up beautifully swan wrapped by towels and the flowers around the swan it made me very special &amp; very welcoming. The bed is very comfortable, I couldn't get out of bed. The villa room was very clean &amp; I love the thick white towels, feels lovely. The restaurants is very flexible, the breakfast &amp; dinner buffet was great, Fantastic Noodle House &amp; Chinese restaurant - great food. I've enjoyed it. Lovely staff with lots of smiles &amp; they were helpful. I definitely enjoyed the hotel &amp; will definitely stay again. The hotel is picturesque and tranquil.I like it .I hope check-out time can more flexible. Evening come to the hotel for three years. Staff was courteous. State of facility however is getting progressively worse. Needs an overhaul or upgrade. In conclusion, good place but needs work! ps Special thanks to Groot, Chen Xiaoqiao, Chen Yueting, and Fu Lianzhu! I have expeted a 5 Star accomodation of Accor group but unfortunately service and houskeeping was by fare no "western style". One of 2 rooms not ready at arrival, no welcome drink offered (had to ask for), breakfast ("Chinese Style"), next table cleaning with desinfection (spray) same time try to "enjoy" the food, smudgy, dirt windows in restaurant, broken vents in bar (answer, only for decoration - actually broken), bath broken flush, sower head clogged (calcified), floor in bath dirty (hair ...), instead of discount on drinks for platin member - full price,... instead of "burning" points, wasting points. I stayed at hotel for 3 days 2 nights for a short vacation as well as celebrating birthday and anniversary. That was the one the best experience I ever had. Prior the stay, the staff was nice and replied my email promptly for the arrangement of dinner buffet. The pool villa was excellent and not too far from the lobby, walked within 5 minutes or you can take the shuttle services. The buffet dinner was great and price was reasonable. This well designed resort was a great choice for my first ever visit to Sanya with mum. Our room was situated on the second floor over looking at the swimming pool with a spacious balcony that happened to be in the shades of several large coconut trees, which is awesome because the sun of Sanya can be extremely strong during the day. The stuff were attentive and helpful, and on our last day of staying, we received a personal hand written note from the housekeeping lady wishing that we had a good time here, that was really sweet. I would like to point out that some of the furniture in the room seemed a little out dated, though it didn't effect us much. Although this wasn't a beach front hotel, it only took us a 5 minutes walk to the magnificent Yalong Bay, which is no biggies at all. Overall this was a wonderful experience and we are most likely to return here in the future! I have stayed at this hotel few years back, but the condition is now not good. The resources and staff is quite inadequate and quality is very bad. Check in handling was not good. Very few buggy available for going to the Villa and no buggy to carry baggage. I almost missed my flight because during check out need to wait for over 40 minutes in the Villa just to get the buggy. On check in the pool was not clean and proper cleaning was only done on the day of check out. The foyer around the pool was dirty with food / oil stains from the previous guests. Too many ants and insects so there does not seem to be any pest control. The doors / fittings etc were all aged and lacked maintenance. Previously the hotel had a private beach area with buggy service, but this time found out that this no longer exists and hotel staff just asks us to walk to the beach which is around 400 to 500 mtrs walk. Breakfast area too crowded and no assistance to arrange tables, just tell your room number at the entrance and then it is more of &quot;fend for yourself&quot; situation. Overall a very poor experience. The villa wasn't as comfortable and spacious that I thought when making the reservation! Hence the value-for-money ratio wasn't very good!